Unified Products and Services Incorporated « The hottest ONE STOP SHOP Business in the Philippines, now open for franchise. The hottest ONE STOP SHOP Business in the Philippines, now open for franchise. 1520 Quezon Avenue, South Triangle, Quezon City. We will cater not only traditional products but also to technology based services such as Remittance, Ticketing, Bills Payments and Loading. Main office. Unified Products and Services Incorporated offer various Dealership packages and Franchise hub that will empower global communities towards attaining financial freedom and economic stability. UPS express exists with the paramount purpose of providing business opportunities to everyone through our world class quality products and services. Look for any of the following franchise consultant below. Contact them first before going to our main office so you will be assisted properly and not waste your time. LOOKING FOR OFFICE, OUTLETS OR DEALERS NEAR YOU? 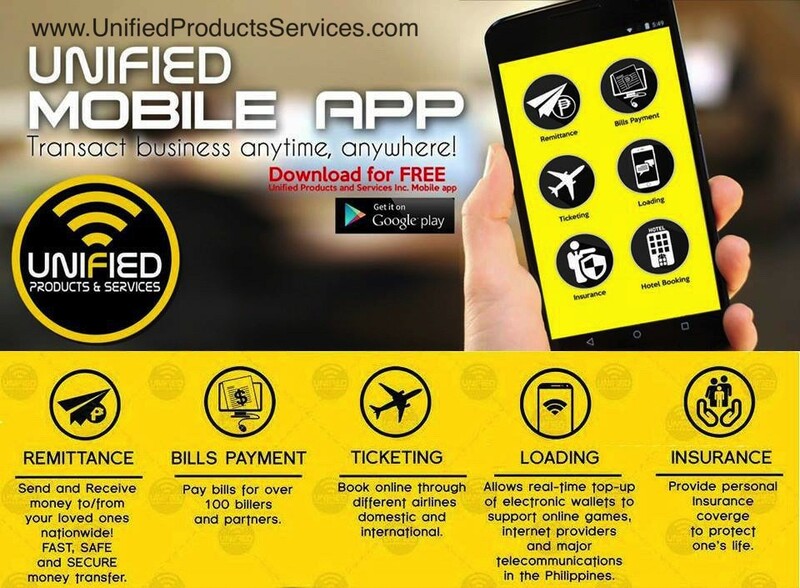 Unified Products and Services Inc is an ALL IN ONE Franchise of Bills Payments, Ticketing, Remittance, Loading, Travel Tours and other UPS express negosyo packages. WE are the HOTTEST all in one business in the Philippines. UPS also offer UpsExpress Online Based Negosyo Dealers Packages. This Home Base Dealer Business packages are accessible anytime anywhere for as long as you have good internet connection. We also have Tangible Products aside from our online products and services. Our business packages will empower communities towards attaining financial freedom and economic stability. UPS Unified Products and Services Incorporated exists with the paramount purpose of providing limitless lifetime earning opportunities to everyone. Discover Unified Products and Services Incorporated! WHY FALL INLINE IF YOU CAN GO ONLINE?